Note that Anchor Mount is not tripod or Capture compatible. Slim, Lightweight Design. The outside sheath of the anchor is black, the middle sheath is yellow and the inner sheath is red. Photographers will appreciate the thicker cord that distinguish the AL-4 from earlier versions. The AL-4 is compatible with Peak Design tripod plates. Peak Design Anchor Links & Strap Connectors AL-4 Quick Disconnect. The all-new Anchor Links will make it even better. Want a strap?. Pop it in. Pop it out. Anchors can also attach to any Peak Design tripod plate. New all-custom aluminum hardware. New adjuster hardware lets you keep Cuff locked in an open loop so you can easily fit your hand through. When not using Cuff, keep it handy (literally) by wrapping it around your wrist and wearing it as a bracelet with the adjustable magnetic clasp. Constructed for comfort and usable as neck or shoulder strap, the Leash features twist-resistant nylon and leather webbing. 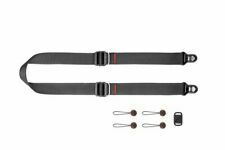 The length of this strap ranges from 32.6 to 57.1" and is 0.8" wide. This is made possible due to the included Peak Design Anchor Links. Press the lockable quick-release button to remove. Holds well over 200 lbs. The all-new Anchor Links will make it even better. Want a strap?. Pop it in. Pop it out. Anchors can also attach to any Peak Design tripod plate. NEW ANCHOR SHAPE. They're tiny in comparison to other strap quick-connection systems that use nylon buckles. Peak Design Clutch CL-3. 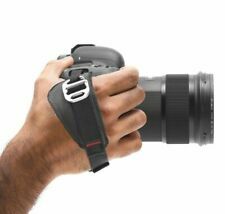 Pro Hand Strap with ARCA Tripod Plate for Cameras. Tripod compatible: compatible with most ARCA-type tripod heads. Made from premium durable materials and hardware inspired by high end climbing gear. Quick-connecting: attaches quickly with our Anchor Link™ connection system. Constructed for comfort and usable as neck or shoulder strap, the Leash features twist-resistant nylon webbing. The length of this strap ranges from 32.6 to 57.1" and is 0.8" wide. This is made possible due to the included Peak Design Anchor Links. 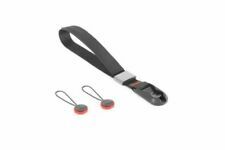 The strap has a width of 1.8" and is made of nylon webbing that is padded internally to help ensure comfortable use. Wearable as a sling, shoulder, or neck strap. 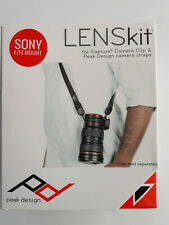 Four anchor connectors and a tripod plate are included with the product. We hope our service will exceed your expectations! If you're not sure, ask and we'll let you know. Connects and disconnects quickly with Anchor Link system. Catalog #: PEAKLBL3. The strap has a width of 1.3" and is made of nylon webbing that is padded internally to help ensure comfortable use. Wearable as a sling, shoulder, or neck strap. Four anchor connectors and a tripod plate are included with the product. Anchor Link connectors let you wear SlideLITE as a sling, neck or shoulder strap, and aluminum quick- adjusters let you change strap length on the fly. QUICK-CONNECTING Attach and detach with one hand using our patent-pending Anchor Link connection system. Note that Anchor Mount is not tripod or Capture compatible. - Rugged, weatherproof machined/anodized aluminum construction.